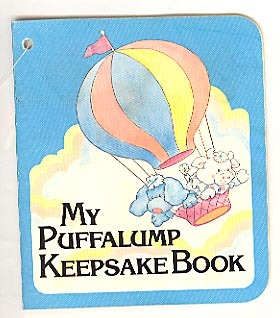 Description: Small square paperback booklet titled "My Puffalump Keepsake Book". The booklet has a blue cover with a picture of a blue Puffalump puppy and white cow in a balloon. 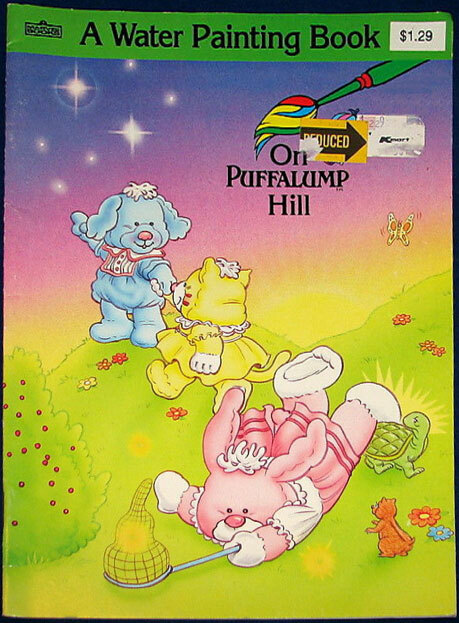 The booklet has pages for children to write the name of their Puffalump, favorite activities, first outing, etc. Measures 3-1/2" wide x 4" high. Description: Puffalumps water painting book with a picture of a 3 Puffalumps on the cover. The book features pages that can be "painted" with a simple paintbrush and water. Marked "Marvel Books". Measures 8-1/2" x 11". Description: "The Puffalumps - A Board Book About Colors - Looking For Green" hardboard book. The pages in this book are all very thick, making it wasy for small children to turn the pages. The cover has a picture of a white Puffalump cow with a magnifying glass. Description: "The Puffalumps - A Board Book About Numbers - One Big Balloon" hardboard book. The pages in this book are all very thick, making it wasy for small children to turn the pages. The cover has a picture of a pink Puffalump Lamb in a hot air balloon. Description: Small square soft padded baby's first "book" that is made of plastic-type material. The "book" does not have pages that turn, only a picture on the front and a picture on the back. The front has pink edges with a white center. The top pink edge is marked "Fisher-Price" in white. The white center is covered in multi-colored polka-dots and marked "Baby Puffalumps family album" in multi-colored letters. The top left edges of the book has a pink 1/8" wide satin ribbon that can be tied to baby's crib or playpen rails. Description: Puffalumps coloring book with a picture of a pink Puffalumps bunny cub on the cover. The bunny is wearing a birthday hat and is surrounded by a cake, presents, and decorations. Measures 8-1/2" x 11". Description: Square 24-page soft cover book titled "The Puffalumps and the Big Scare". The cover has a picture of a yellow Puffalump Cat and a blue Puffalump Puppy running in a green field away from something. ©1987 Fisher-Price. Written by Jon Chardiet. Measures 8" tall x 8" wide. ISBN #0-87135-245-1. Description: This is a Puffalumps annual that was sold in the UK. The book has stories about Puffalumps, and a variety of Puffalump activities. The cover has a picture of Puffalump animals riding a roller coaster. Description: Puffalumps coloring book with a picture of a peach Puffalumps bear cub on the cover. The bear cub is wearing a red cap, holding a ball and glove in one hand, and a baseball bat in the other hand. Measures 8-1/2" x 11". Description: Square soft cover book titled "The Puffalumps Christmas Poems". The book has brightly colored pictures on each page of Puffalump Charactures enjoying things that people do at Christmas time. The book features Christmas poems and a short Christmas story. This book was published by Marvel Books, licenced by Fisher-Price, written by Marci McGill, and illustrated by John Spiers. Measures 8" wide x 8" tall. Description: Square hardback book titled "The Puffalumps Pillow Poems" . The cover is blue has a picture of a child dressed in pink sitting beside a yellow Puffalump Cat that is holding a book. Measures 8-1/4" square. Description: Square 32-page hardback book titled "Puffalumps Pillow Tales" . The cover has a picture of 6 Puffalump animals sitting on a clowd reading a book that the peach Puffalump Bear is holding. The book tells 6 different Puffalump stories. Written by Nora Smith, Illustrated by Kristin Johnson. Measures 8-1/4" square. ISBN #0-87135-243-5. Description: Square soft cover book titled "The Puffalumps Treasure Hunt". ©1987 Fisher-Price. Written by Cathy West. Measures 8" tall x 8" wide. Description: "The Puffalumps Picnic" - an 8-panel soft vinyl fold-out "book"
Description: "The Puffalumps Band" - an 8-panel soft vinyl fold-out "book"